So I’m extremely behind on all my blog posts, but now that I’ve made it safely back to America I have some downtime to catch up on everything I haven’t written about towards the end of the term. I’ll start with my amazing weekend in PARIS, FRANCE. I went for a three day weekend to Paris with my friend Raleigh, Nov. 30-Dec. 2, and looking back now I want to say it may have been my favorite place I visited. We started the weekend with another insanely early morning by getting to the bus stop at 4:30 AM to start our travels to the airport. After another bus, a plane, and two trains, Raleigh and I made it to our hostel and checked in around 12:30 PM. The hostel (Young and Happy Hostel) had a great location, Rue Mouffetard, but it wasn’t the best hostel I’ve stayed in through my travelling experience. Our first day there wasn’t the most perfect day for weather… we had dreary skies and it was pretty cold, but I’m glad we didn’t have to trudge through the rain or snow on the first day. For lunch, I stopped at a crepe vendor on our street and got my very first authentic French crepe with ham, cheese, and lettuce. It was delicious! We speed-walked our way through the city to the meeting point of a free walking tour of Paris. Our guide, Onno, took us through the main parts of the city and told us tons of interesting facts about main tourist attractions, as well as tips for what to do and when. The walking tours are always great to do on the first day because it gave us a good idea of what to go see (major landmarks like the Louvre, Arc de Triomphe, the Eiffel Tower, and Notre Dame) and we got our bearings of the city. I also was very lucky because Raleigh had visited Paris over the summer and knew a lot about how their metro works and where everything is. The tour ended right around 4:00 and dropped us off right by one of the most popular shopping/touristy streets called Champs de Elysee. Before we went on our way, our tour guide offered us tickets to go up the Eiffel Tower and cut the lines for that night, so we bought them and made the plan to go later. Raleigh and I then explored the main shopping street, which was filled with tons of Christmas booths at the beginning and reminded me a lot of Winter Wonderland in Hyde Park with the holiday items they sold. We looked around for just a bit, but then had to hop on the metro to make our way to the Eiffel Tour at 5:30 to go up! Let me tell you, the Eiffel Tower at night is one of the prettiest things I’ve ever seen. It has a golden glow to it and the first time I saw it up close I was in awe. It was definitely a lot bigger than I had imagined it. We used our tickets to cut the line and made our way up in an elevator (placed in one of the legs of the tower) that took us half way up, but not completely at the top yet. Raleigh and I took in the view; from just the mid-way point of the tower we could still see so much. By this time, the sky was dark but the city was shining in beautiful lights. 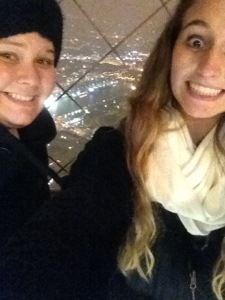 We took a few pictures, and then got back on another elevator to go to the very top. I can’t really describe the view from the top of the tower without using the word incredible. We could see for miles out in the distance, and the entire city was just lit up from the darkness. It was really beautiful. There were obviously tons of other tourists up there taking pictures, but one young teenage couple decided that making out for a half hour was a better way to spend the time. Ew, too much. One other interesting thing about my experience on the Eiffel Tower has to do with the pickpocket signs that are posted everywhere in there. Inside the tower, they warn you to be mindful of people who pickpocket. I saw the signs and didn’t think much of it because it just seemed like everyone there were just normal tourists like Raleigh and I who wanted to take in the view from the top. However, the view is not all that some people wanted to take. Raleigh and I were in line to take the elevator back down the tour when she noticed a large family standing together in a little circle kind of discreetly pointing at people and mumbling things in French (I think). These people are known as gypsies and they were literally pointing out places for the group to move to so that one of them could slip their hands into a woman’s purse. I quickly held on to my bag tighter (after being pickpocketed in Israel this summer, I’m pretty careful). Raleigh turned around to the line and told everyone to watch their bags, basically calling out the group of people being super shady. They immediately walked away from the line to another part of the tower. So we actually saw a group of pickpocketers in action! So crazy. It was kind of sad though, because their group consisted of a few little kids too which unfortunately have to learn from their parents how to properly steal from people. Hopefully the Eiffel Tour workers really look out for them, because I didn’t believe it until I really saw it. Raleigh and I had dinner at a really snazzy place she’s been dying to go back to since her trip in the summer. It was called the Burning Bush and was pretty expensive but we wanted to treat ourselves on the first night in the city. The restaurant was pretty full so they gave us a table where we had to sit next to each other in a booth area. Pretty funny/awkward, but the food was so delicious and we were starving so we didn’t care! Haha. We ordered a big pot of beef stew with veggies and devoured the entire thing. After dinner, both of us pretty much sleepwalked back to the hostel and passed out in bed. Day 2Since we got a good night’s sleep, Raleigh and I woke up around 8:30 and had the complimentary breakfast at our hostel, which consisted of croissants, tea/coffee, and cereal… along with nutella, jam, and butter of course. We made a day plan to spend the first half in Versailles and took the train there, which was only maybe 30 minutes outside of the city. We ended up buying a two day museum pass that would let us tour pretty much all the museums in Paris, so that really came in handy for the next two days. Versailles was the enormous mansion inhabited by Louis XIV and his wife Marie Antoinette during the French revolution. We walked around inside the castle and got to see tons of rooms decorated by Marie herself. There were so many entertainment halls with gorgeous paintings all over the walls and ceilings. We also got to walk through the king and queen’s separate bedrooms, which were pretty incredible to see since a lot of the things are still the originals from the 1680s (such as bedding and wallpaper). My favorite part of the chateau was the Hall of Mirrors. It is one of the most famous parts of the estate and is the biggest room in the palace. The hall has 17 big mirrors that face opposite large windows overlooking the amazing gardens outside. It is actually known as one of the most famous rooms in the world because of its elegance and decoration. It was a really big deal at the time that Louis XIV lived there because mirrors were one of the most expensive items to possess at the time. I walked up and down the hall a few times, taking in all the detail of the room. It really was incredible to see how elegant they made it, and the view out the windows was amazing. After touring the palace, we took a walk out by the enormous Versailles gardens. I can’t really begin to describe how massive that backyard was… and how beautiful it all looked. Raleigh said it was greener and even prettier in the summertime (which I can just imagine), but it still was so pretty to walk around that day because the sun was shining and it was nice outside. The gardens take up 1,976 acres… just to give you an idea of how massive the place actually is. There were fountains, lanes of trees, pretty trimmed bushes… everything all perfectly kept to look beautiful for the public. Raleigh and I stopped for lunch at a little restaurant back in the gardens. I ordered one of the most popular dishes served in Paris (from what I’ve seen on all the menus)… it was called croque-madame. This consists of warm ham in between two slices of bread, with melted cheese on the top of the bread, and a fried egg on top of the cheese (a croque-monsieur is all that without the egg). I loved it! After our morning in Versailles, Raleigh and I ventured back to central Paris to walk around more there. We went back to Champs de Elysee and looked around a bit more at the Christmas booth. I got a crepe with banana and nutella… YUM. That main street leads straight up to the Arc de Triomphe, where Raleigh and I used our museum pass to walk up. The Arc de Triomphe is one of Paris’s most famous monuments. It was built to honor those who fought and died for France during its revolution, and has the names of all French victories and generals inscribed on its surface. Beneath its vault lies the Tomb of the Unknown Soldier from World War I. There is no elevator to the top of the arc, so we walked up a big spiral staircase of 284 steps! I can’t tell you what perfect timing we had when we got to the top. We got up right at sunset and had the most amazing view of the city. The pictures speak for themselves. The Eiffel Tour stood overlooking the city with a beautiful pink/orange sky, and we got to see the whole city light up as all the buildings and Christmas lights started turning on. The arc is located in the middle of the world’s largest intersection (and most hazardous I assume), with 12 streets all leading up to it. From the top, you could walk around and see each street leading up to the large circle which the arc was located in the middle of. It was just simply awesome. We took a bunch of pictures from the top, watched the sun go down, and made our way back down the arc, but not before buying a few things from the gift shop inside it! On our walk back to our hostel, I stopped to buy a delicious chocolate macaroon and ate that for a late dessert after dinner. I was told that the macaroons are the most delicious in Paris! 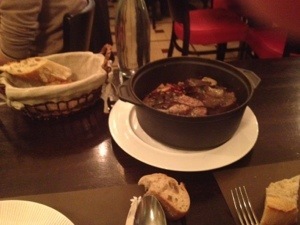 For dinner, Raleigh and I ate at a restaurant on the street of our hostel and I got traditional French onion soup. It was the best I’ve ever had! 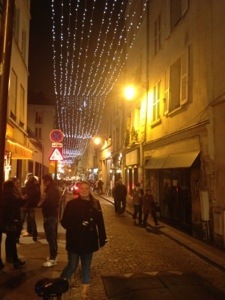 Our street, Rue Mouffetard, was so pretty with the lights on at night! It also had a really cool, young scene to it which I really liked. After dinner we went back to the hostel, got some wifi, and went to bed. On our last full day in Paris, Raleigh and I woke up pretty early again, ate breakfast at the hostel, then made our way to the Louvre! Again, I can’t even begin to describe how massive this museum was. It’s one of the world’s biggest museums. If you wanted to, you honestly could spend an entire week in there looking at everything in there. There are three wings to explore, with multiple floors for each wing. We weren’t too interested in spending the entire day there, but we obviously made our way to the biggest attractions… first up: the Mona Lisa! Seeing the Mona Lisa in real life was pretty darn cool. I was surprised to see how little the painting actually is though. They have it hung on a little wall in the middle of a big room, encased in glass. But the funny thing is that opposite of the Mona Lisa was this MASSIVE painting on the other wall, which makes the Mona Lisa look even smaller. It was pretty funny how they set it up. It’s true that her eyes follow you no matter where you walk in the room. There were tons of people surrounding the painting taking their own tourist pictures of it. We also went to a few other main attractions in the Louvre, such as the sphinx, the Winged Victory statue, and the Venus de Milo statue. It really was a cool place, but a little overwhelming. Our next stop was to Musee d’Orsay with tons of other French paintings, mostly impressionist and post-impressionist works. 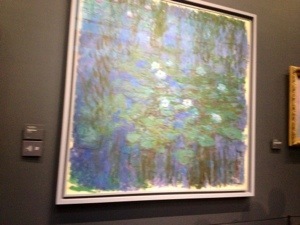 We got to see paintings by Monet, Manet, Degas, Renoir, Cézanne, and Van Gogh! This museum didn’t let its visitors take pictures, but I snuck a few from my iPhone! 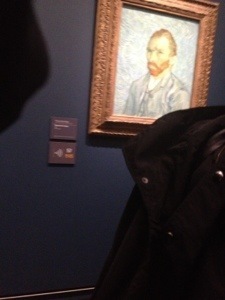 It was cool to see the self-portrait by Van Gogh. After that, we walked over to the Notre Dame Cathedral. It had beautiful French Gothic architecture and was really big inside. There were tons of windows with gorgeous stained glass and we walked around inside and took some pictures. You have to be quiet inside and there was some kind of service going on in there when we walked in. The city is currently prepping for its 850 year anniversary by touching up some things on the inside and out of the cathedral. It looked really cool! We visited one last chapel with more beautiful stained glass windows, and started our walk back to the hostel to grab our stuff and head towards the airport. However, on our walk back there we ran into a spot I was looking for the whole time in Paris. We found ourselves in the front of the steps/street from the movie Midnight in Paris with Owen Wilson. The steps appear in the scene where he gets picked up by the magical carriage that takes him back in time. It was so cool to realize we were at that exact spot from the movie… which we completely stumbled upon. Obviously, I freaked out a little bit and took some pictures by the steps (which were actually steps up to a church). Pretty cool stuff. My last meal in Paris consisted of waffles and ice cream as one last treat in the city of love! Raleigh and I had such a great weekend in Paris, and I’m so glad we had pretty much three full days to explore and see the city. It was probably my favorite place I’ve visited because there was just SO much to do and see. We were on our feet the entire time, and the food there was just delicious. 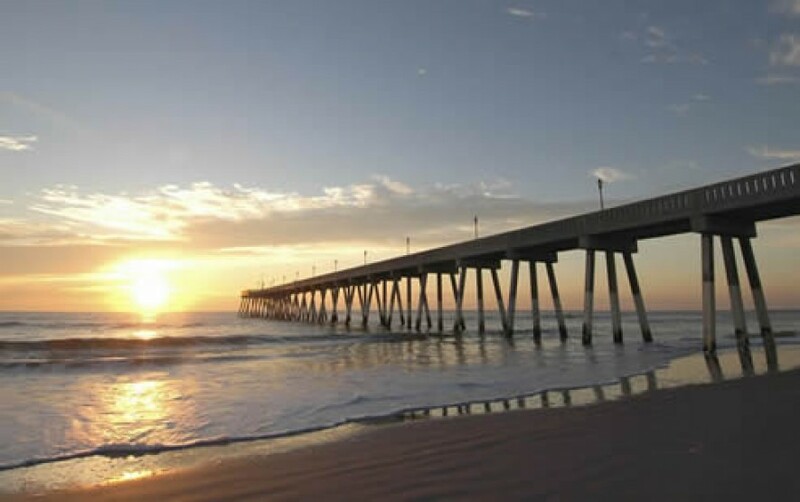 I’d LOVE the opportunity to go back there some day… especially with a boyfriend or husband! It really was a romantic place. So that’s all about my Paris excursion. More to come soon about how the end of my semester ended in London!